Home / News / Halifax Shipping News / Windmill Parts for Sheet Harbour. The HHL Tokyo arrived last night for bunkers, and will be proceeding to Sheet Harbour to unload wind turbine parts. Designed for project cargo and heavy lift, HHL Tokyo was built as Beluga Procession, originally for upstart Beluga, who attempted to grow to fast and collapsed in 2011. 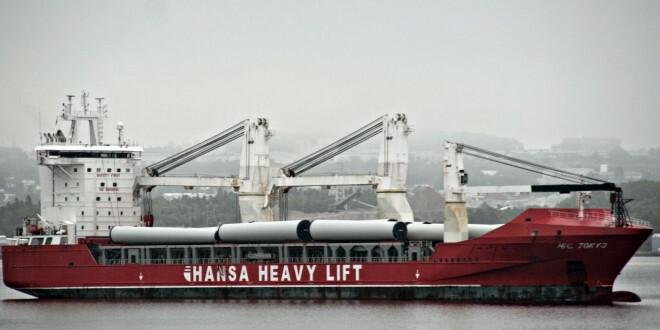 (Beluga made a few trips to Halifax, including delivering new CGCS Lifeboats) She was Picked up by Hansa Heavy Lift of Germany as a brand new vessel, being on the blocks when Beluga Failed.